Lexington, Ky. – The USEF Equine Disaster Relief Fund put out a call to the equestrian community on Monday to donate towards hurricane aid and relief for horses in the Houston, Tx., area and the response has been remarkable. Since that call to action, the fund has generated over $150,000 in donations thanks to the giving of concerned equestrians. 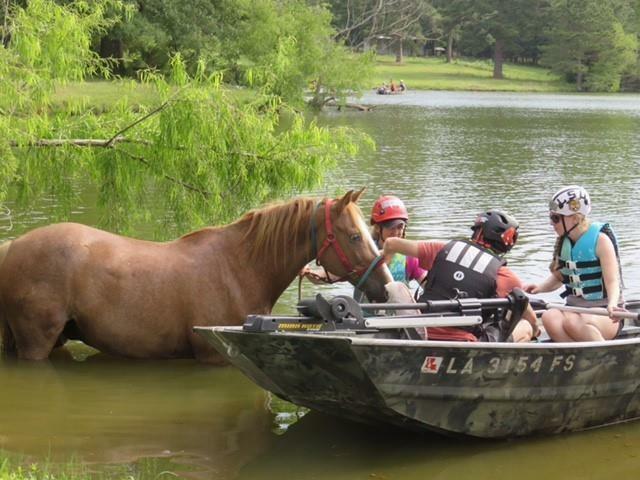 One hundred percent of these donations will be given to the Houston SPCA, Texas A&M University, the Texas Equine Veterinary Association (TEVA), and other equine rescue organizations. Within the first 24 hours of the call to action, donations reached $50,000, and a generous donor stepped forward offering to match the next $25,000 in funds given. Since that time, the USEF Equine Disaster Relief Fund also has received a donation from USEF partner Ariat for $10,000 and a pledge from the equine charity Brooke USA for a dollar-for-dollar match on the next $25,000 donated, with the goal of reaching $200,000. Make a donation to the USEF Disaster Relief Fund here. As the floodwaters continue to rise and then recede, there will be a need for ongoing support and aid. Several organizations in Houston and surrounding counties are providing relief services, lists of needs, avenues for product and monetary donations, and other ways to help. Financial donations are preferred, due to the difficulty in getting supplies from outside the region to affected horses. The American Association of Equine Practitioners (AAEP) Foundation has launched a website that provides multiple avenues for monetary giving. Additionally, a supply list is posted online and specific donation hours have been set for those located in the Kentucky area. In Texas, TEVA has specified donation hubs around the state for those looking to donate feed, supplies, buckets, halters, shavings, etc. Click here to find your nearest hub. Individuals interested in volunteering their barn, stalls, or transportation services should contact office.teva@gmail.com. The Texas A&M University Veterinary Emergency Team ensures that animals impacted by disasters such as Hurricane Harvey have a chance at survival and veterinary care. There are several avenues for giving to their veterinary emergency team. Developed in 2005 during the aftermath of Hurricanes Katrina and Rita, the USEF Equine Disaster Relief Fund was formed to help ensure the safety and well-being of horses during trying times. Since its inception, over $500,000 has been donated to aid horses across all breeds in disaster-related situations. All money donated to the fund is used strictly to benefit horses and horse owners. This entry was posted in FEI & USEF Dressage News, Horse Health, News and Announcements on September 1, 2017 by ludlumfarms.